Venting a stove from the rear should be considered a last resort. Flue gasses prefer to travel up through a vertical flue unhindered. Negotiating around bends, the flue gasses drop in temperature and slow down, which can cause build up problems. 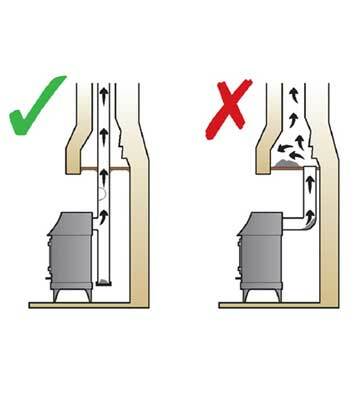 If a stove needs a flue venting from the rear, the maximum it should travel horizontally should be no greater than 150mm (6”) before the gasses can begin to rise up through the chimney system. It is forbidden to use a plain 90° bend in the solid fuel industry. It is considered dangerous and life threatening through time. This tends to be the product of choice supplied by the ill informed plumbing counter staff or dubious retailer who has no real background in the solid fuel industry. The correct product to use is a ‘t’ section and plug, which creates much like a sump and allows soot and deposit from the flue to fall below the horizontal pipe, which means restriction in the flue diameter is less likely.